The system of invisible sliding doors of Doal allows you to save space, dividing the environments in a functional way with the extremely agile mechanisms, and is also a synonym of a modern, stylish and luminous design. The invisible sliding doors of Doal guarantee a great impact for what concerns design and allow the creation, inside the house, of interesting games of lights and colours of special domestic scenes. The invisible Tao sliding door, used to close passage areas. The beauty of this system is the total absence of the track, a freedom of installation ever seen. One of the most imposing models of sliding doors with invisible track. You can obviously order it in the size that you prefer and is a great compromise between saving space and having privacy. 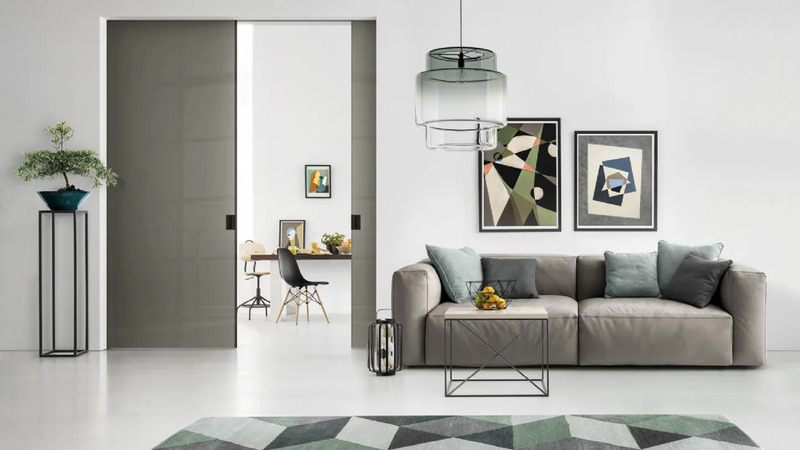 They remove the encumbrance that is necessary in the case of swing doors and also (though to a much lesser extent) of the sliding doors external wall; the surface of the wall is completely free and thus new and unprecedented opportunities become possible regarding the type and arrangement of the furniture. The tracks disappear inside the wall and the door becomes a real piece of furniture, attracting attention with its exclusive finishes and its charismatic image. The dynamism of the disappearing effect gives concrete form to a more fluid architectural concept and gives greater flexibility to the entire apartment. The sliding is made by means of an upper truck that is fixed to the wall and two lower slides hidden in the door. The doors remain aligned in the lower part thanks to a floor guide fixed to the floor. The suspended sliding doors of the invisible system designed by Doal can be more classic, i.e. made of wood, a timeless material that allows you to always build warm and welcoming atmospheres; or glass with a thickness of 10 mm. In the latter case, of course, brightness is the added value. Invisible recessed sliding doors move inside the wall by means of concealed sliding mechanisms, which are based on the use of counterframes or metal structures (in Doal aluminium) consisting of a box inside the wall and a sliding system called track that allows the door to "disappear" into the wall compartment.